A student creates a Web site that contains fake obituaries of fellow students. The school suspends him. The parents then sue and win in court. Incidents of bullying, harassment, and threats in schools are growing, but the line between students’ rights to expression and the school’s rights to protect children and faculty is increasingly blurred. To create effective disciplinary and management polices, educators need to understand the legal ramifications of their actions. 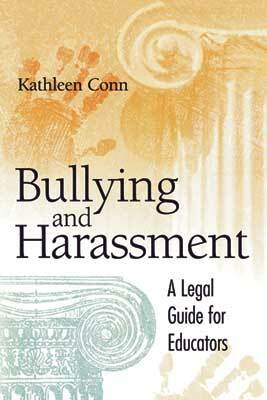 Bullying and Harassment: A Legal Guide for Educators provides the practical information that they need to help students while avoiding litigation pitfalls. Appropriate guidelines for both short- and long-term responses. Using recent court cases and school events that made major headlines, Conn examines how educators should respond to incidents where the law isn’t clear and where different court interpretations seem to apply. With its timely information and analysis, Bullying and Harassment shows how every educator can take a proactive stand to ensure safe schools and communities. KATHLEEN CONN is an educator and public school administrator as well as a lawyer and member of the Pennsylvania Bar. Conn earned her Ph.D. in Physics/Biology at Bryn Mawr College, studying molecular dynamics with pulsed nuclear magnetic resonance techniques. She completed postdoctoral work in the cell biology of cancer metastasis at Lankenau Medical Research Center in Philadelphia.